The Arlington Resort Hotel & Spa in Hot Springs, Arkansas is shedding some light on energy conservation. And by doing so the hotel recently received an incentive rebate check for almost $58,000 for replacing thousands of light bulbs with ones that are more energy efficient, along with new fluorescent fixtures and equipment. As Arkansas’ largest hotel, located in the heart of historic Hot Springs NationalPark, the Arlington Resort Hotel & Spa is a “cruise ship on land.” It’s a self-contained resort with all of the ambiance and hospitality of a traditional, grand old Southern hotel. Established in 1875, it features full spa service in the Thermal Water Spa, fabulous restaurants, beautiful landscaping, a national park right outside any door, and easy access to arts and tourist attractions in the city. This philosophy makes it a resort for the ages: historic and contemporary at the same time. 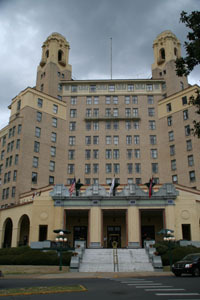 For more information about the Arlington Resort Hotel & Spa, click www.arlingtonhotel.com. 800-643-1502.